So, I had never heard of the term “Crunchy” until I was speaking with my uncle about an organic, all vegan protein powder I wanted to create. He said, “So, you’re targeting crunchy people?” I was kind of like, huh? Well, I ended up finding out that “crunchy” people are people who try to do everything the natural, holistic way. They are, basically, hippies. I liked the sound of “crunchy” people, but I knew at that point I was not even close to being “crunchy.” Yeah, I meditate, and I try to only put natural things on and inside my body, but I was still eating dairy products, and I still ate anything put in front of me, or in the house, that was “vegetarian.” That included chips, chocolate, suckers, grilled cheese sandwiches, cheese pizza, veggie pizza, sandwiches that were mostly bread, cheese quesadillas, bean burritos, etc. I was, and still am not, the picture of health. Within the past week, I have been learning tons of new things about foods like: Irradiation, sprouting grains, etc. Also, I’ve been learning new things about detoxifying my organs, how to keep my body in a state of peace and tranquility, body brushes, and just plain clean and healthy living in all aspects of my life. Did you know that people are really supposed to squat when they use the bathroom? squat when using the bathroom, that aren’t too much of an inconvenience. The first option is very cost efficient and relatively easy. Go to Dollar Tree, or another cheap store, and buy one of those disposable roast pans. I think you know where I’m going with this. ;p Yes, I am asking you to use this to squat over when you poop. Then, when you’re done, you can dump your dump into the toilet. Some people who do this like to put some toilet paper where there poo is going to land in the pan, that way its not too messy. You could also line the pan with a grocery bag, and then just tie it up and throw it away in a trash can far away from your house, or in your appartment complex’s dumpster. The second option takes a little bit of money, but this is very easy, and there is no mess. 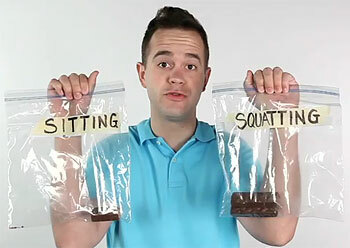 You can make a squatting platform to place over your toilet. The instructions are located here. Just click on the picture of it on the left. The third option is to actually stand on the toilet seat and squat. This is very difficult, and will take some practice, but it is good to know if you want to go to someone’s house, and they don’t have a squatting platform or a Squatty Potty, see the next option. The last option is to obtain a Squatty Potty. This are not the best option, that’s why its last. They are not as good as squatting because using the Squatty Potty, your legs are not doing anything, accept raising. 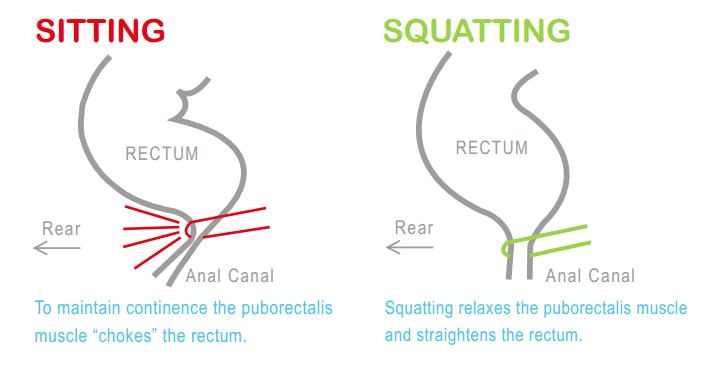 This is a good option if you are just starting out “squatting” to poop, and this is definitely easier. I hope this was informative, and I will be posting some more options for a different way of living. Next Post Start & End Your Day Out Right… Smile!